Furano is located on Japan’s North island of Hokkaido. Sapporo's New Chitose Airport is Hokkaido's primary airport and Asahikawa Airport is Hokkaido secondary airport. Furano is located between the two. Whether you are coming from New Chitose Airport, Asahikawa Airport or Sapporo City, there are numerous options for the two and half hour to three hour transfer to Furano Resort and Furano Town. We can book any of the following services for you. In order to book, we will need to know your flight number and times or the name of your hotel. A great value bus service running a number of routes between Furano and Chitose Airport, Asahikawa Airport, Sapporo City and Niseko. A convenient, private, door-to-door transfer service good for groups of any size between Furano and Chitose Airport (CTS), Sapporo City or the other major Hokkaido Ski Resorts. 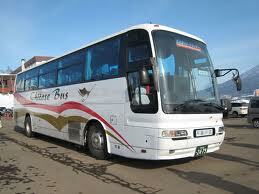 Start your first class holiday experience before you arriving in Furano with the luxurious Coolstar Limousine Service. Relax in the spacious plush white leather interior and enjoy the extra legroom.